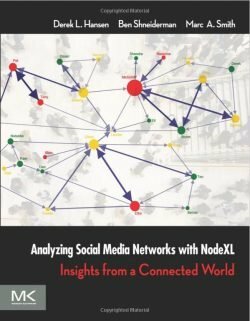 Derek Hansen, Ben Shneiderman, and Marc Smith have written a book titled Analyzing Social Media Networks with NodeXL: Insights from a Connected World published by Morgan Kaufmann. The book includes 3 parts: Part 1 introduces social media and network analysis, Part 2 is a tutorial introducing core network concepts while walking through the major features of NodeXL, and Part 3 is a collection of case studies written by various network experts analyzing different social media tools (e.g., email, forums, Facebook, Twitter, YouTube, Flickr, wikis, and hyperlink networks). are working on the new book “Think Link” which will be available in spring 2018. Sign up for our newsletter to stay updated on the progress and availability of the next NodeXL book.